Vacation rental townhouse. Sleeps 6, 3 bedrooms, 3 bathrooms. No pets allowed. Ready for a great week at the beach? Then check out Conley! 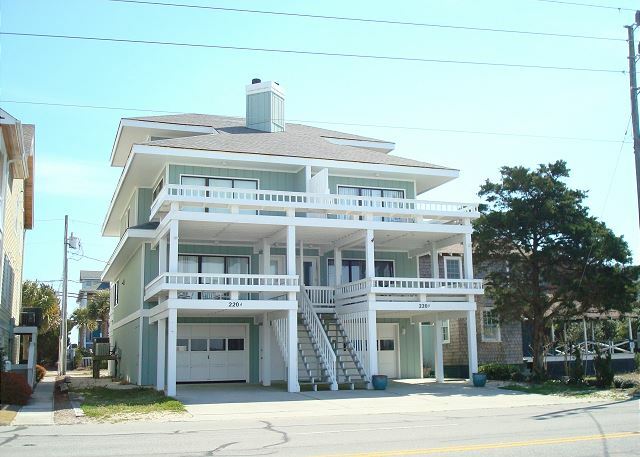 This 3 bedroom 3 bath duplex home is located near the center of Wrightsville Beach and offers easy beach access and direct sound access. Enter the property and step into the comfortable living area. The open floor plan flows easily and includes the living area and kitchen. The kitchen features a wrap-around bar which make serving meals a cinch. There is also an additional informal dining area off of the kitchen. This dining area has a large slider door that has a covered porch and gives a sort of al-fresco dining feel. 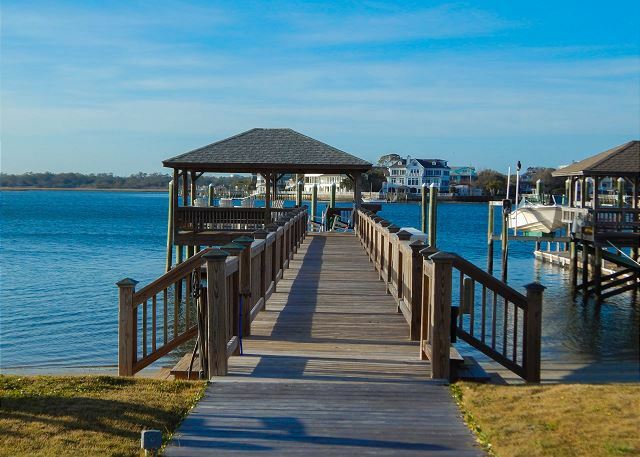 There is also a spacious porch off the living area that is great to take in the warm breezes off of Banks Channel. Head up stairs and find the master bedroom and guest room. The master bedroom offers a queen size bed, large private sound side deck and private bath. The master bathrooms features a large Jacuzzi tub, stand up shower, and double vanity. The guest bedroom also offers a queen size bed and private deck along the ocean side and provides some limited ocean views. Head up the stairs and find bedroom 3 that provides 2 twin beds. This property also features a private boat slip and gazebo. Perfect for bringing your boat or just relaxing and taking in the beautiful sunsets over Banks Channel. Call or book online today. Very pleased, great location with our son stationed at USCG Wrightsville Beach Base. Sunsets every night were lovely. We had a great time!! The dock made the trip. We could not be happier with the the team at Wrightsville Sands that has made our multiple seasons on South Lumina and glorious sunrises and sunsets on the Atlantic and Banks Channel. Jill Hatfield is always available to work with her guest to make their stay special. Responsive, friendly, professional why we keep coming back and would recommend Wrightsville Sands properties. If you are nice to Jill, she may tell you where we have stayed so you can have a great experience as well. Wonderful stay! Loved the location and the accessibility to the new beautiful dock and gazebo. Made keeping our boat so easy and convenient! Will definitely stay again! Not as updated as some rentals but very clean and perfect for our family! Spent 2 weeks here and the weather cooperated. The view of the inlet/channel was wonderful with the waterfront seating...bring your fishing poles. Overall the house is comfortable but ready for a redo. Beds soft and sliding doors didn't lock, no windows to open...but really, we aren't complaining. It really is a great place with some of the best sunsets. Glad you guys had fun. Come back to see us! Had a great family get together over Thanksgiving weekend. The weather was great for November. Family enjoyed fishing from the dock and walks on the beach. This house has the best of both worlds, sound and beach access! We enjoyed our stay. The location was prime. The house layout was also workable. The oven desperately needs to be replaced. The burners come on and off and the oven dials are illegible. Aside from generally updating the place (oven, t.v. 's), it worked very well for our family. Great location, nice little house. Great rental. Real estate company very professional and easy to deal with. Conley was clean and had what we needed. Loved the dock. i usually use a different realty co, have been going to wrightsville for 15 yrs, and do many rentals throughout the yr. you made a great impression on me, will def call you again. Thank you for your review. We are happy to hear that you enjoyed your stay. We hope to have you back again real soon. Loved the location, loved the dock and convenience, great value, would come and stay again and plan to. Great house for a family with a boat. Dock is nice and well maintained. House is plenty big enough for 6 - 8 people. Clean and updated as well. Priced very reasonably compared to surrounding property. The beach is just a short walk. Can walk down to restaurants, stores, etc. Would stay here again.